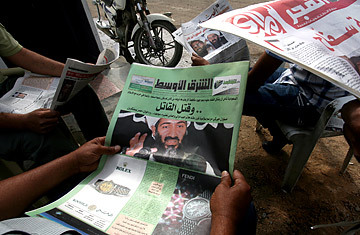 Iraqi men read newspapers in Baghdad on May 3, 2011, displaying front-page headlines and photographs in response to the death of al-Qaeda leader Osama bin Laden, a day after he was killed in a U.S. raid at his compound in Pakistan. Will His Death Bankrupt al-Qaeda? The death of Osama bin Laden comes at a time when al-Qaeda in Iraq has been shifting strategies in an effort to recover from years of setbacks. A source within the security department of the Iraqi government tells TIME that according to Baghdad's intelligence work, "al-Qaeda is setting up new plans in Iraq  changes in their leadership and locations, moving them from south to north, from one city to another. That makes us more worried that they could carry out successful attacks  and maybe a very big attack or revenge attacks for the death of bin Laden. Al-Qaeda promises to do these things, and I'm afraid that with all the added support they have now, they will be able to." Recent bombings, he says, prove they are still able to hit out at practically any moment. After 9/11, when the U.S. war on Afghanistan destroyed bin Laden's ability to run al-Qaeda as a centralized organization, the terrorist leader anointed Abu Musab al-Zarqawi as the leader of al-Qaeda in Iraq to lead the campaign to take over the country in the post-Saddam era. But al-Zarqawi was killed in 2006, and so were his successors: first Abu Ayub al-Masri, then Abu Omar al-Baghdadi. As a result, al-Qaeda in Iraq adopted new tactics, says Mutlak Ak-Aljbori, a former al-Qaeda fighter turned U.S. ally in the Awakening movement that was key to the success of the 2007 surge. The embattled group kept its choice of new leadership a secret and changed the way it communicated with adherents. Instead of making physical contact, group members corresponded through encrypted text messages and the Internet. They also started wearing Western attire and shaving their beards so they would not stand out to the Americans or the Iraqi government. But bin Laden always remained the inspirational core of the al-Qaeda ideology. He put his directives and vision of al-Qaeda leadership into a manifesto that spread across terrorist sites on the Internet, engendering like-minded organizations in Yemen, Syria, Egypt, Morocco, European nations and Russia. Even without a central command, these various al-Qaedas could connect with one another to conduct attacks or train new fighters in safer environments. The test now is whether the various al-Qaedas can continue their informal linkages without the unifying symbol (and facilitation) of bin Laden, who, according to what U.S. sources describe as his diary, remained keenly interested in approving his distant lieutenants as well as fomenting attacks against the West in spite of his fugitive status. Bin Laden's deputy, Ayman al-Zawahiri, retains seniority in the organzation, but although al-Qaeda in Iraq has formally pledged support to him, most of the al-Qaeda leaders do not want to replace bin Laden with al-Zawahiri. First, they see the Egyptian physician as too old; second, many of them do not agree with his leadership methods; and third, they don't see eye to eye with him in his interpretation of the rules of Islam. TIME's sources were unwilling to detail these differences of opinion. If anyone emerges as the new symbol of al-Qaeda ideology, it may be Anwar al-Awlaki, the U.S.-born Yemeni cleric who is the constant object of drone attacks in his ancestral country, one as recent as May 5. In contrast to al-Zawahiri, al-Qaeda adherents in Iraq see al-Awlaki as young and sharp. He has charisma and a strong personality that al-Zawahiri lacks and at the very least has inspired a number of attacks against Americans. Al-Qaeda sources see him as determined, even savage. Among Iraqis sympathetic to al-Qaeda, al-Awlaki possesses the traits of courage, leadership and manhood that they look up to. "In the end, I expect the one who will lead al-Qaeda after bin Laden will be Anwar al-Awlaki from Yemen," says Sadoun al-Mayahi, a political analyst and specialist in al-Qaeda and extremist groups in Iraq. "He is a young man and fresh, with a strong personality like bin Laden." The only thing that appears to be in al-Awlaki's way is that he does not appear to have had bin Laden's approval. A story in ProPublica cites U.S. sources familiar with the documents found in Abbottabad saying bin Laden rejected the offer of the al-Qaeda leader in Yemen to step down in favor of the more popular al-Awlaki. The story also said bin Laden disapproved of the content of al-Awlaki's online magazine Inspire.